Gone are the fair-weather boaters with their blaring radios and boats bristling with broomsticks. No more planer-board trollers claiming 300 foot right-of- ways, or obnoxious broadcasters insulting everyone with a VHF radio within 50 miles. Catch & release season is the time of year when the one-man-one-rod concept reigns supreme. It’s when you can run on-plane for miles in the wide-open Bay and never see another fishing boat. A time when there’s very little competition for prime fishing spots, and a small but tight fraternity of hard-core fishermen brave the elements to jig the cold-weather hotspots. I anticipate the start of C&R season like a kid waits for Christmas. My sons Jacob and Daniel are visiting from Tennessee this week. We’ve been trying to work a fishing trip into our schedule, but we couldn’t get it all together until today. Fortunately, Mark invited us to join him for a trip on his Parker Pilothouse out of Queen Anne Marina on Kent Island. We met him at the dock about 1:00 PM and had to break ice to get out of the harbor. Following the winter strategy of looking for warmer water, we pointed the boat south toward some favorite mid-Bay fishing spots. Since I haven’t been out in a while, I wasn’t sure what to expect. On the way, the boys asked me what I thought our odds were. I put it about 60/40 against catching any big fish, but 80/20 in favor of finding schoolies. The only other boats we saw on the Bay were freighters and duck hunters. After tying on some 1.5 ounce kandy-korn jig heads (courtesy of Fischadler Lures), we hotrodded 7″ bass assassins with orange or chartruese garlic dye, and started jigging. Jacob hooked up on his first cast and followed it up with another low 20s schoolie. Mark positioned the boat perfectly on the next drift and Daniel quickly called out “fish on!” landing another striper in the same class. After a few more fish, Mark suggested we try another nearby location. We knew he’d made the right call when I felt a light bite and set the hook into something solid. A few deep rod dips followed by a screaming drag made it obvious I was fighting a good fish. My Christmas gift from my wife this year was a 60 inch muskie cradle. 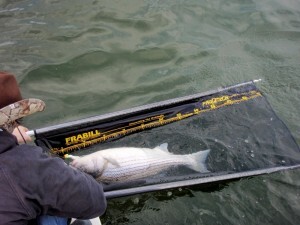 It’s a soft mesh stretcher-type net that allows the fish to be measured and released without ever leaving the water. I christened my net with a fat 38 inch striper that would’ve gone well over 25 pounds. I’ve posted a video of the muskie net in action on the video section of CLT. We followed that fish with several more before we had to leave in order to bounce back up the Bay in 15 knot winds with a following sea. We were all thankful for the shelter afforded by the pilot house as freezing spray coated the boat with slippery ice. Adrenalin kept us warm while we were catching fish, but finding the Marina iced back in, we realized temps had never risen above freezing all day. Overall, I considered it a typical winter trip and a welcome break from the hustle and bustle of the holidays. A few big fish is about all we can expect until mid-February, but there are usually schoolies around to be caught and released thoughout the winter. I was happy to have beaten the odds with the bigger fish. 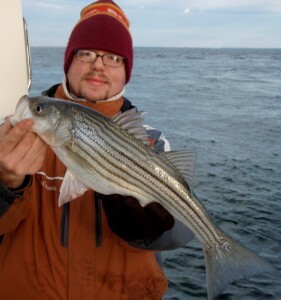 Few sportsmen experience the pleasures of cold-weather Chesapeake Bay fishing, even though it often produces trophy stripers. Even when the fish don’t bite, the winter waterfowl and overall solitude of the Bay is well worth the trip. If you have the chance, I strongly suggest you gear-up and get out. Thanks, Mark, for the trip. Made my week. Nice article. Sounds like a great Wintertime trip! Make sure we leave a little earlier next time, I don’t need a harrowing boat ride home to end an otherwise great day of fishing. 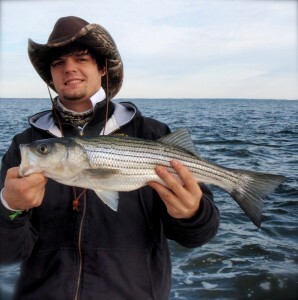 Shawn: As normal you have written another enjoyable article with educational information on how to help protect our striped bass fishery. Thanks for the pictures and for sharing your trip. The discharges in the Upper Bay might be unproductive for some time. There was a sewer spill of 22,000 millions gallons of mixed sewage last week on the Patapsco River. 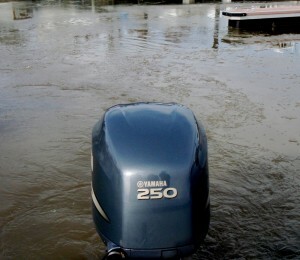 See you on the Mid-Bay once I bring my boat up from Cape Charles. 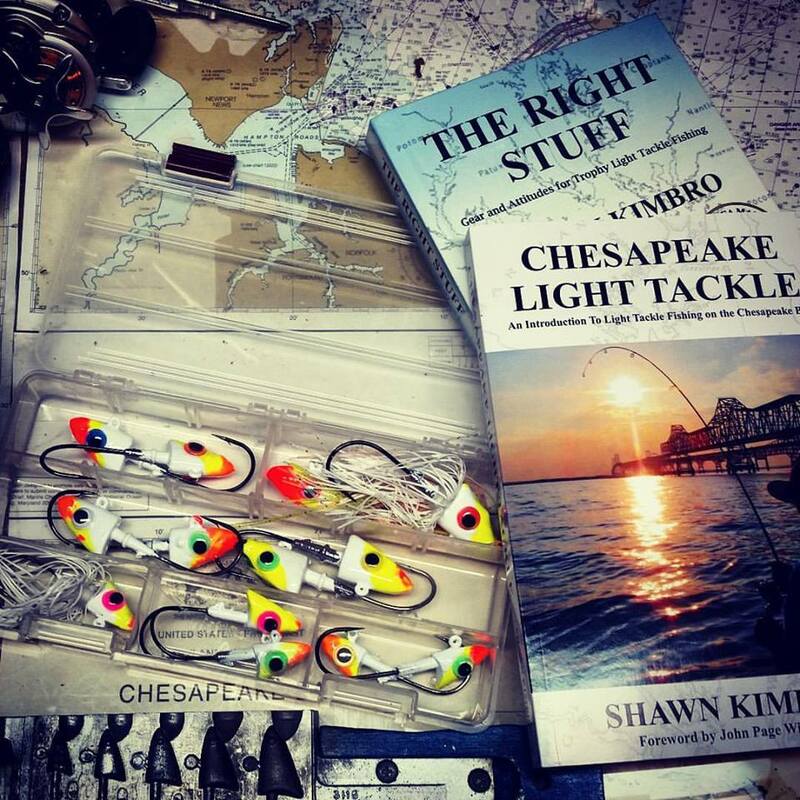 I will be striper fishing (C&R) on the Atlantic Ocean this month. Good job guys! I am glad you all got out. Looks like you had a well deserved great day! Glad you guys had the chance to get out there and catch, been itching to get out there too. Beautiful fish and the cradle idea is great but I’m guessing you would need a extra pair of hands to work it. Glad you got out. You did much better than I did. Very nice fish and thanks for the report. Mike, I think we were farther south than you. I’m hoping to get to the bridge this week and I’ll let you know how it goes. Congratulations on a good trip. I agree with your comment about the solitude of the bay being well worth the while. I have an idea whene you all may have been. Not going to ask, not going to speculate here. I just know that I got a hankering to go out myself as soon as I can. Oh, by the way. I like your moon phase graphic on the site. I learned a lot from you this past year about moon phases and current. When I do try for a winter C&R, I’m going to plan it around the moon! Thanks again, and thanks for a good read.